Staircase Spirit is a writing site that I run in collaboration with my wife Denise. I want to call this project a blog, but most blogs don't have 60k-word entries, so maybe it is more like a new-school fansite. It is built upon in-depth essays about video games, movies, tv shows, fandom, and whatever else strikes our nerd nerve. Most essays are written and edited collaboratively. Beyond writing, my responsibilities for this site are primarily design-related. 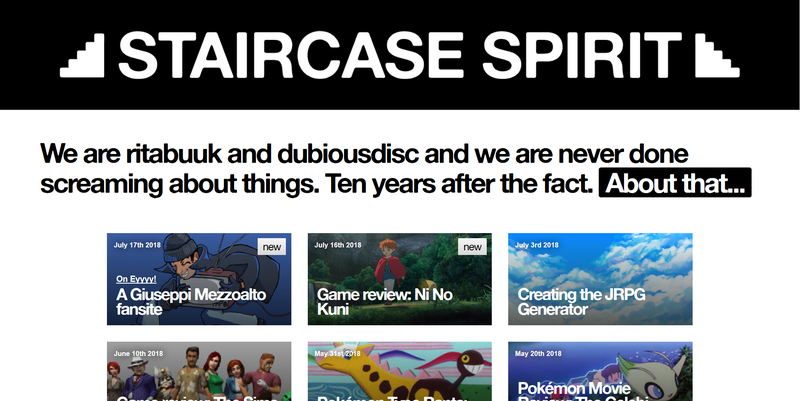 Staircase Spirit is built on a CMS we made specifically for this project, with Denise being the main programmer. This CMS, which we call Stairwell and we are preparing to release as open-source, is structured around the ability to design each page individually, with or without a template that is shared between articles. I am in charge of designing and maintaining the main template, and each of its individual variations. The index page is structured as an easily-accessible menu of articles to read. This is because Staircase Spirit's entries are not time-bound, and with older entries being always relevant, we don't want them to be buried in an archive. 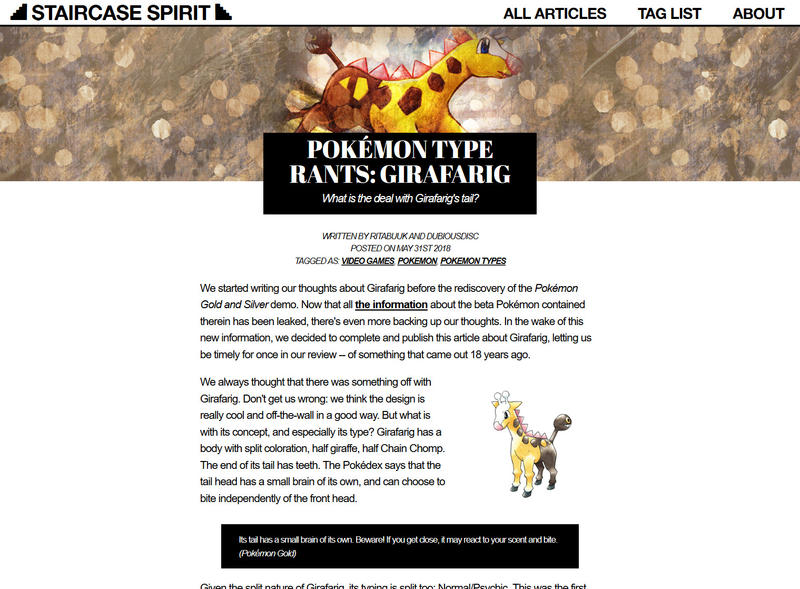 A standard article (Pokémon Type Rants: Girafarig). Each article has a custom-made graphic header fitting the subject. By default, the template is white and black so to accommodate our intensive use of images in each article. 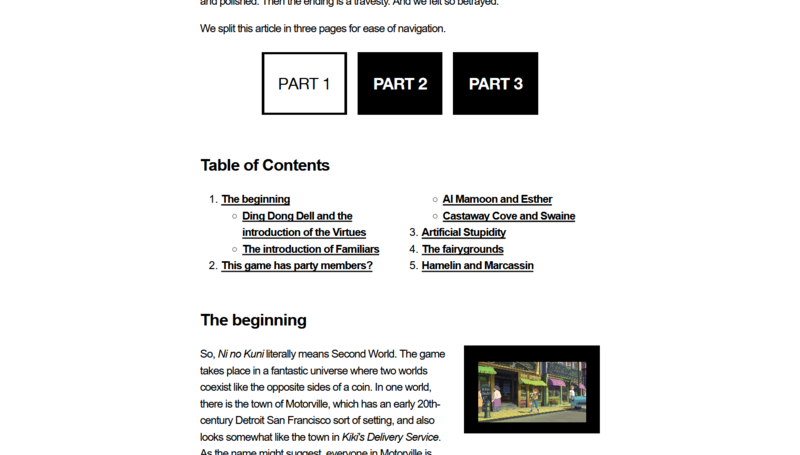 Particularly long articles, such as our 30k-word review of Ni no Kuni, are paginated to aid navigation, and feature a table of contents which is automatically generated from the headings used in the article. Staircase Spirit is designed around being able to have different design choices for each page. 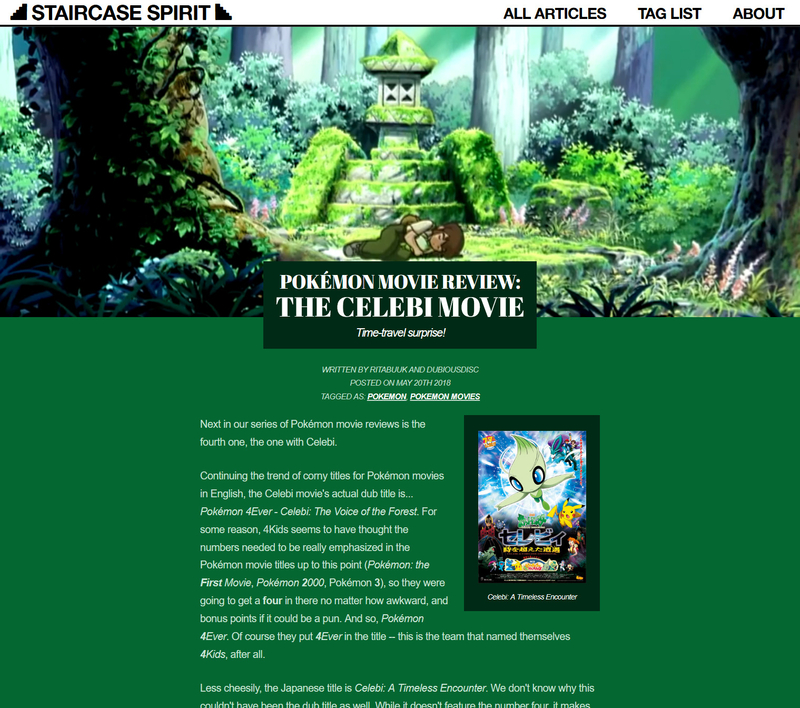 For example, our series of reviews of the Pokémon movies (here is our review of Celebi: A Timeless Encounter) have templates in colors fitting the main theme of each movie we're reviewing. 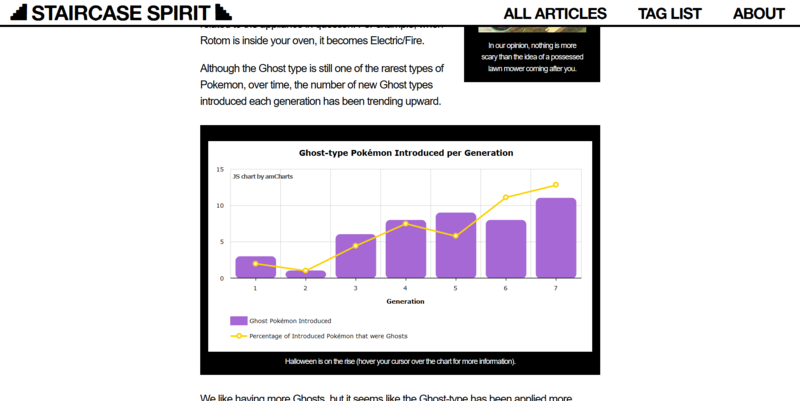 Each article can contain third-party interactive elements, such as this table that appears in our article about the Ghost type in Pokémon. Spoilers and other side information are hidden under elements that need to be clicked to be revealed. This example is in our Cities Skylines Gothic article, in which the full explanation for each blurb is hidden by default. Once again to avoid giving priority to newer articles over old ones, the tag list is also built in a way more similar to a menu. For the rest, Staircase Spirit is about sitting down and reading. 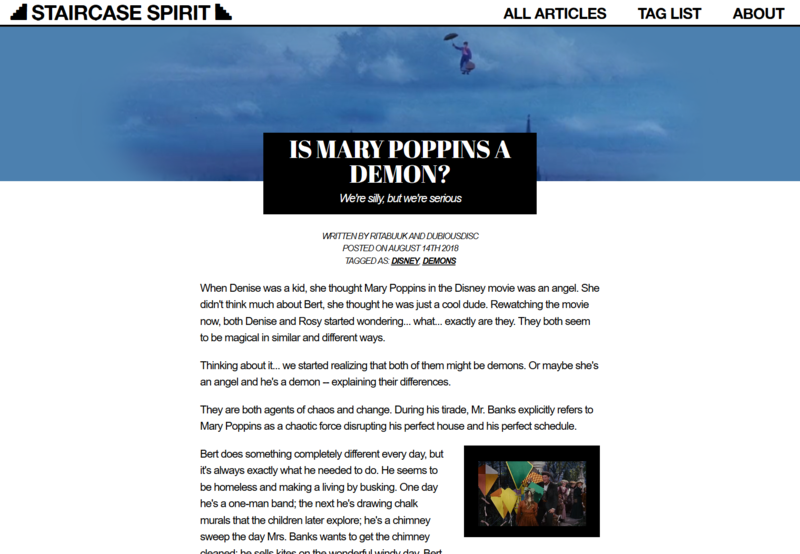 Here's a good (and not too long) example of our writeups: our article about the possibility that Mary Poppins might be a demon. No sense shielding you from our strange minds at this point, yeah?